Liquor | KBK Bakery's Adventures in Baking! 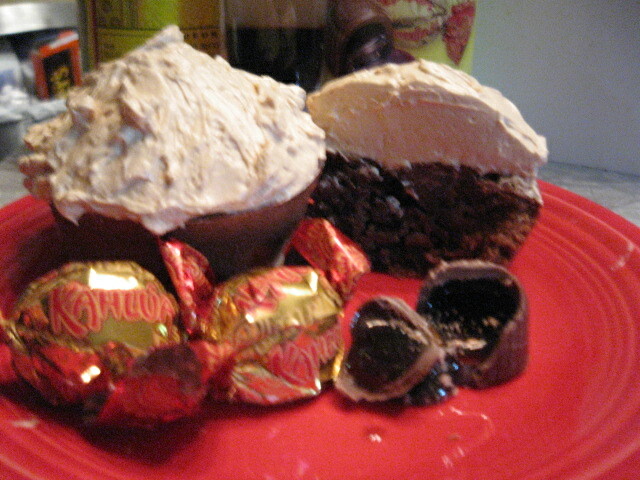 When I saw the challenge of creating a cupcake using liquor I immediately thought of Kahlua. I know a had a wonderful recipe for coffee buttercream and thought Kahlua would be a wonderful complement! I adapted a cake recipe from the the Blue Willow Restaurant. Well “adapted” may be too strong of a word… I used their recipe and replaced half the water with Kahlua liqueur. The coffee buttercream is from a Daring Bakers Challenge to make a yule log. I like to use spiced rum in my coffee buttercream because I think the flavor goes well with the coffee. And the Kahlua candy… well… you can never have too much chocolate in my opinion! Since this was a new adventure I have some tips! First off! Be *very* careful that the candy is not all the way to the bottom! If it is the liquified candy causes the bottom of the cupcake to fall off! If you are using foil liners you’re good to go, but if not (like me) your cupcake bottoms are a mess! Also, if your buttercream looks like it is seperating, just keep beating it! It looks a little iffy after you add the rum and coffee but it comes back together! The cupcakes are simply scrumptious! I’ve never made them before and thought them up especially for my attempt at Cupcake Hero-dom. Grease or line two cupcake pans. Preheat oven to 350° F. In mixer, combine flour, sugar and salt. Melt chocolate with butter, Kahlua and water Add melted chocolate mixture to flour mixture and mix lightly. Add sour cream, vanilla, baking soda and eggs and mix well for 2 minutes. Pour batter into pans and press a Kahlua candy into each cake. Be careful that the candy does not touch the bottom of the pan. Cover the chocolate with additional batter, if desired. Bake until toothpick inserted in middle comes out clean. Bake for 20 minutes. 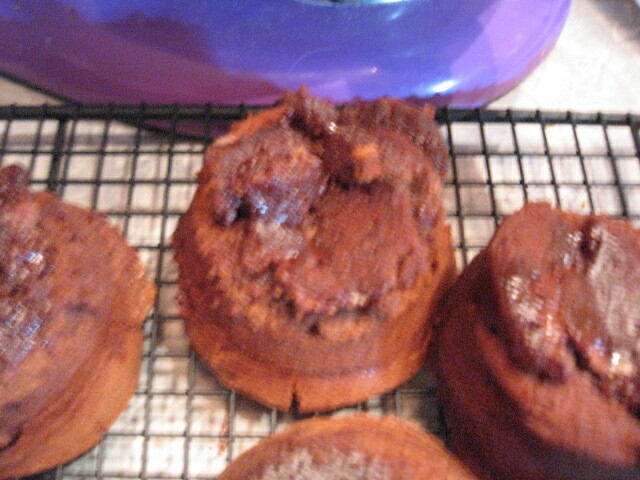 Cool on rack 10 minutes and unmold cakes to cake rack to cool completely before frosting. Attach the bowl to the mixer and whip with the whisk on medium speed until cooled. Switch to the paddle and beat in the softened butter and continue beating until the buttercream is smooth. Dissolve the instant coffee in the liquor and beat into the buttercream. Top each cupcake with the buttercream.